The 1970s & 1980s saw the USA dominate the horror market, in the 1990s it was Japanese horror films that flooded our screens, but the 2000s saw Spain emerge as a major player in horror cinema. And whilst a few names jump out at the mention of modern Spanish horror cinema, none jump higher or louder then Mexican director, producer and writer Guillermo del Toro. Whilst his 2006 dark fantasy film Pan’s Labyrinth(El Laberinto del Fauno) is arguably del Toro’s most famous as well as his most critically acclaimed Spanish language film, with its mysterious faun and Pale Man. 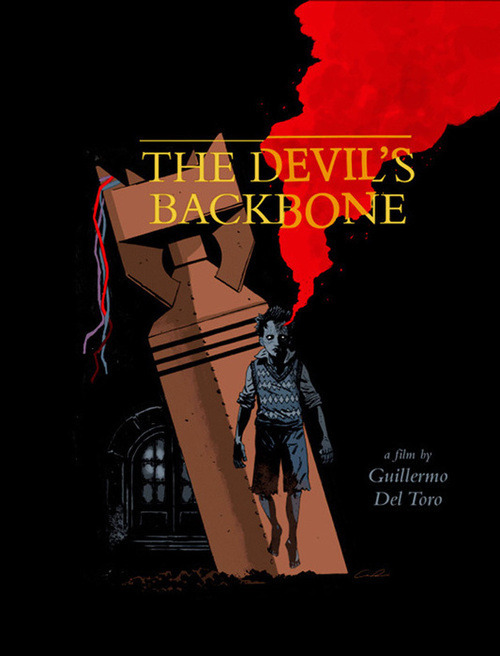 Its predecessorThe Devil’s Backbone (El Espinazo del Diablo), which del Toro describes as his most personal work, with its Spanish Civil War setting and examination of the human spirit is the one that changed the way we view ghost stories. 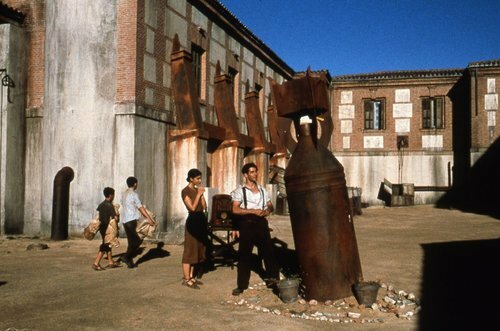 Set in the final months of the Spanish Civil War,The Devil’s Backbone follows the story of Carlos, a young boy who has been left at a remote orphanage, believing his father is coming to collect him soon, but unbeknown to Carlos his father has in fact been killed in the war. The orphanage is run by steely headmistress Carmen, kindly professor Dr Casares, along with teachers Alma and Conchita, and Conchita’s fiancé Jacinto, the orphanage’s aggressive and scheming caretaker, who lived at the orphanage as a child and harbours a burning hatred for the place. In the courtyard sits an unexploded bomb, dropped by Franco’s troops on the same night orphan Santi disappeared without a trace. As Carlos strikes up an unlikely friendship with the orphanage troublemaker Jaime, he begins to learn more about Santi’s disappearance and uncovers a web of deceit within the orphanage, at the same time he is visited by Santi’s ghost who predicts death and destruction for the orphanage. Whilst on the face of it The Devil’s Backbonesounds much like the countless ghost stories that have gone before it, upon closer watching it provides a chilling examination of the human spirit, a new way of viewing the ghost character in ghost stories, and Santi, arguably one of the most creepy and disturbing child ghosts ever put on screen. 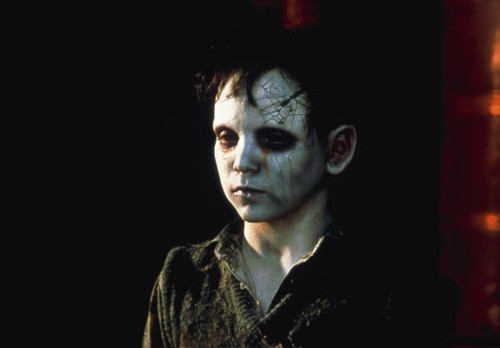 What is perhaps most fascinating when looking at The Devil’s Backbone is the character of Dr Casares and his pondering of what a ghost actually is, especially in relation to the orphanage’s caretaker Jacinto, the most ghost-like of all the human characters in the film. Through the course of the film it is revealed that Jacinto lived at the orphanage as a child, and despite his passionate and burning hatred towards the place, he still does not leave it. He is a sad and tormented character, frequently described as “a prince without a kingdom” by Carmen. As Casares ponders the definition of a ghost, one of his musings describes a ghost as “something dead which still seems to be alive”, which is possibly a better way of defining Jacinto than as “a prince without a kingdom”. For whilst he is a living human character, he appears to be dead inside, unloving towards his fiancé Conchita, evil towards the orphans, with contempt towards Casares and the orphanage. Yet despite his hatred for the orphanage, he refuses to leave, almost as if the place has a hold over his, much like a ghost that cannot lay itself to rest. The other interesting element of the film is the image of Santi, as well as how he is portrayed as a ghost. It is the case with most ghost or monster horror films that what you don’t see can be infinitely more scary that what you do see, the mind can contort moving shadows and fleeting glimpses into far worse things than can ever be put on screen. However, once the monster or ghost is revealed it ceases to be scary, it is just another character in the film. The character of Santi, is one of the few exceptions to this general rule, fleeting glimpses show nothing of the sheer creepiness of this ghost of a young boy with black eyes and blood still flowing from his wounds. But what is perhaps the strangest thing about the ghost of Santi, a trait which forces us to look at ghosts differently, is that whilst he haunts and pursues Carlos he means him and the other boys no harm. Whilst typically most ghost characters display the characteristics of poltergeists, malicious, dangerous, meaning harm to any human characters they meet, Santi is simply a spirit who cannot rest, whose liberation requires only one soul: the one who killed him, everyone else is safe, from Santi at least. Santi is a character with a proper back story, a purpose, a mission, not just a cheap trick designed to scare the audience by upping the body count in a bloody fashion, as is the case with so many horror films. What is a ghost? A tragedy condemned to repeat itself time and again? An instant of pain, perhaps. Something dead which still seems to be alive. An emotion suspended in time. Like a blurred photograph. Like an insect trapped in amber. A ghost is me.